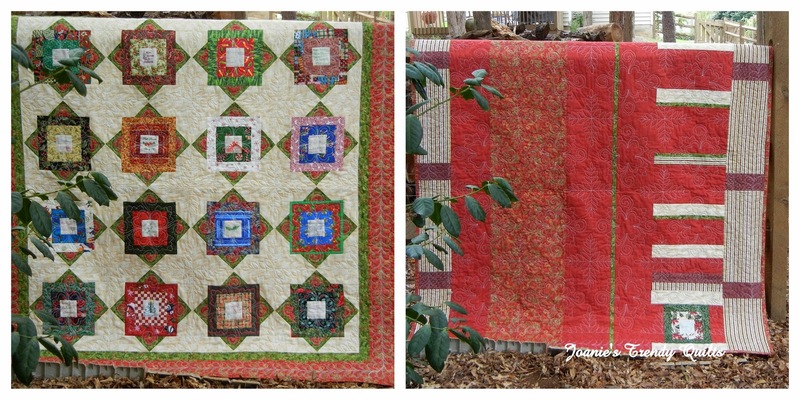 Today I came across where SwimBikeQuilt is sponsoring a linky party to show off the backs of our quilts. I hadn't planned on another post but just couldn't stand the idea of missing out of another fun linky party. So thank you Katie! Christmas Swap Block. Each block was fairly simple. I added the on-point section to each block. Back was using up all the Christmas fabric I had on hand. I love the thin strip going down the middle of the quilt. I used an extra block I made for a quilt label. One of my earlier quilts - Crossroads. Still one of my favorite quilts. Pattern came from "The Weekend Quilt" by Leslie Lindsey. Back looks rather modern doesn't it? This was before the Modern Quilt Movement emerged. Challenge Block of the Month Quilt. Again one of my earlier quilts using up stash. The backside was my own invention. I love star quilts! Again using up fabric on hand. Star Autograph Block Swap. Getting more wild with the backing. It was during the period when we were calling Lime Green the new Neutral Color! 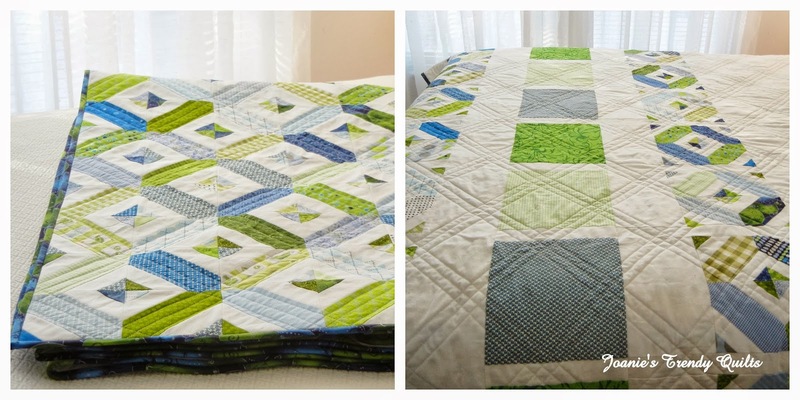 Blue and Green Modern Quilt - Learning to transition from traditionalist to modern here. I had a bunch of blocks left over so why not incorporate them into the back of the quilt. I may still have enough blocks to make a pillow case to go with it. 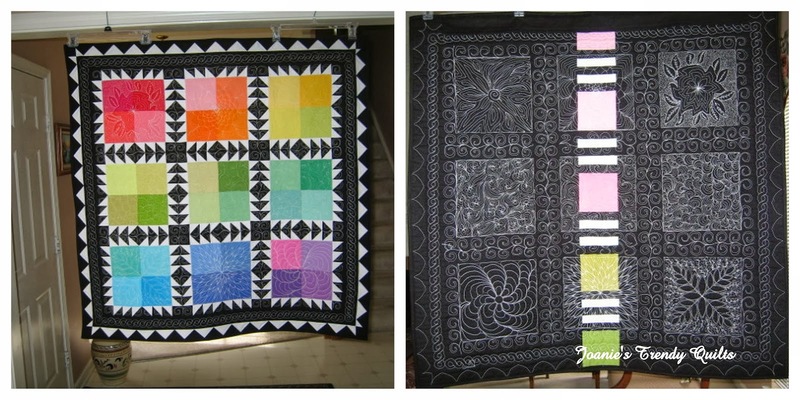 Craftsy Block of the Month 2012 quilt - finished in 2013. I love the Garden Path so it was incorporated in the back of the quilt. I would still like to do a whole quilt in this pattern. Robert Kaufman Kona Challenge. I love the little center strip going down the back. Free motion quilting on this quilt is quite dense. I was having a great time following Leah Day's video tutorials. 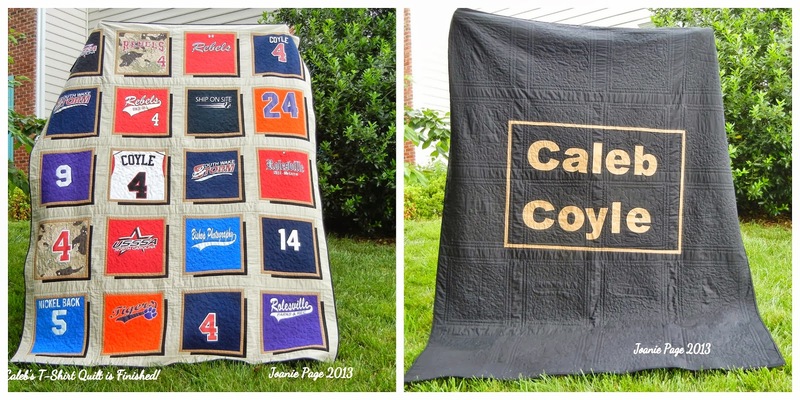 Baseball t-shirt quilt for my darling grandson. He probably would gag if he new I called him darling! I have a tutorial somewhere on this blog on making those large fusible letters fused with Heat n' Bond! - Great stuff! Hope you enjoyed this show as much as I had revisiting some of these quilts! Again thank you Katie. So come and join the party. I can't wait to spend some time seeing how other quilter's created their backs. 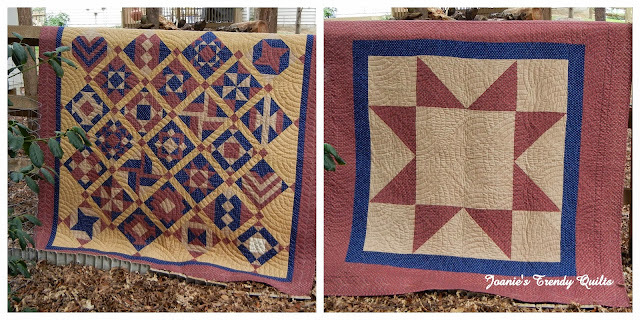 It was great seeing some of those older quilts again. They all look fantastic! And the quilting - absolutely beautiful! I still think Santa should bring you a longarm. your quilt backs are gorgeous! I love the blue and green one! You are very creative with your backs. Thank you for the inspiration! Your quilt backs are beautiful! 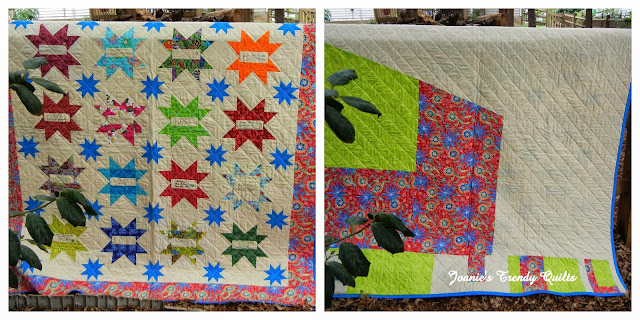 Joanie, I love the back as well as the front of your quilts! I have to get more creative with my quilt backs. It seems to be a new trend. Why should the front get all the attention?! You put as much work in the backs as you do in the fronts! Beautiful work. I tried to pick a favorite but they are all so awesome. But if I had to choose, that Robert Kaufman Kona challenge back is just spectacular! Leah would be proud. 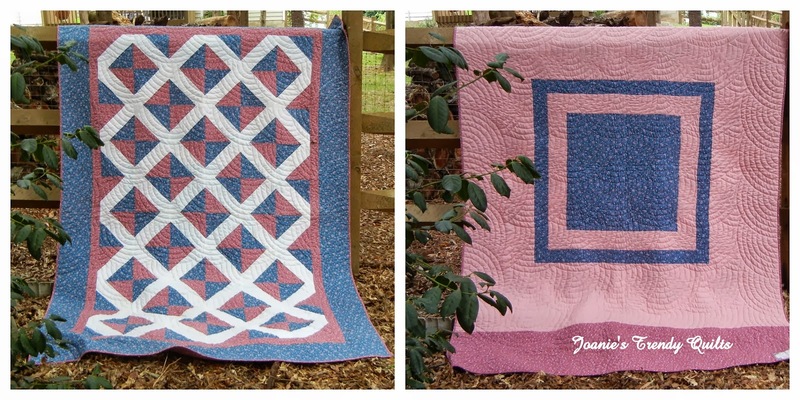 Joanie, your quilts are STUNNING! Specially the one with Leah Day's designs, the back looks fantastic! I just doodled the daisy block the other day! 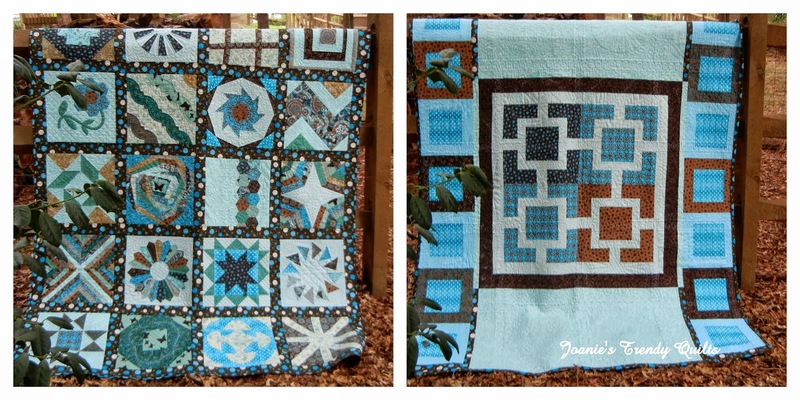 :) And love the sashing on your BOM quilt, it's so nice to see what other people did with the blocks. Thanks so much for sharing these eye candies! I love pieced backings! Its just so much more appealing to have two attractive and interesting sides to a quilt. I especially like your blue and green modern backing! I'll have to link up to the party too once I'm done with my christmas sewing. How nice to look at your quilts here. The backs are great. How wonderful! Twice the quilt for the price of one. Your work is outstanding.